Almost two dozen tax law experts have endorsed the Freedom From Religion Foundation’s legal objection to a discriminatory religious tax giveaway. FFRF’s challenge of a special tax break for clergy, now before the 7th U.S. Circuit Court of Appeals, has unleashed a numbing list* of legal adversaries, all loudly insisting that clergy deserve and must be given a unique housing tax privilege. Most of the numerous signers of nine briefs against FFRF’s lawsuit are Religious Right legal groups and religious denominations — not just conservative or evangelical denominations but even including liberal Jewish sects and the Unitarian Universalists. This posse of indignant clergy tax break defenders has, however, mischaracterized the tax code and the nature of the clergy housing allowance, according to 22 tax law professors. 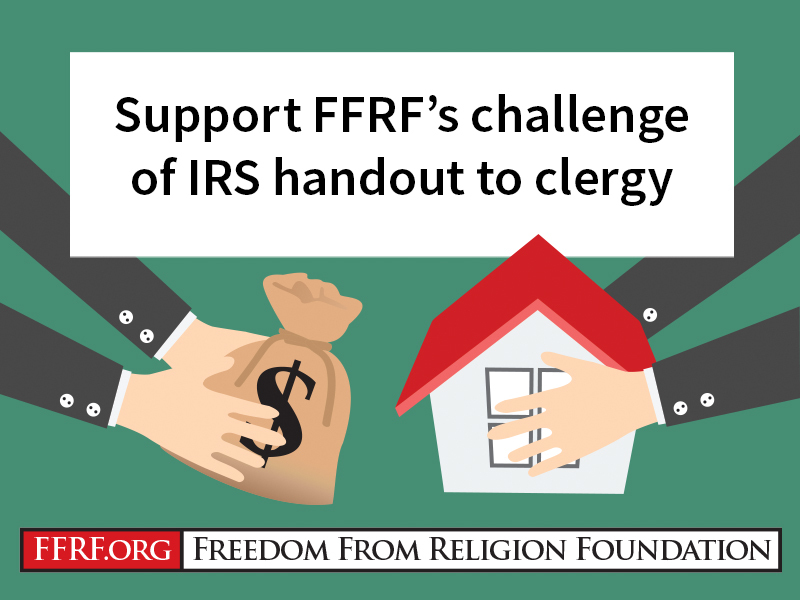 Coming to FFRF’s rescue is a snappy friend of the court brief by these tax law experts, who demolish the claims by churches that the housing allowance is primarily for the convenience of the employer. The tax professors contend that the housing allowance is a subsidy for ministers, is not an appropriate accommodation for religion, ignores important differences in ministerial income and entangles church and state. Contrary to “Chicken Little” claims by churches, a court holding that the provision is unconstitutional would not threaten other exemptions. The housing allowance was passed by Congress in 1954 with a stated intent by its sponsor to reward “ministers of the gospel” for fighting “godlessness.” Church employers may designate part of ministerial salaries as “housing allowances,” which may then be subtracted from the minister’s taxable income. The generous provision permits ministers to exempt rent, mortgage interest, utilities, repairs and many other home expenses. FFRF designated a housing allowance for its executive directors, Annie Laurie Gaylor and Dan Barker, arguing they are similarly situated to clergy as leaders of a nontheistic organization. Contending the housing allowance is both unconstitutional and discriminatory, FFRF went to court, winning a resounding victory at the district court level in 2013. The 7th Circuit threw out the case the following year, contending Barker and Gaylor first needed to apply for a refund and be denied one before being able to sue. When the couple actually applied and were refused the refund, they and FFRF went back to court, again winning a firm ruling in federal court last year. Once again, the Treasury Department and IRS have appealed the lower court ruling, and once again, the court victory has resulted in a hysterical outcry by howling clergy. Further, the housing allowance is an outright subsidy. Exempting something from taxation is no less a benefit than sending a check, the experts remind the appeals court. Even the government has conceded that targeted tax breaks — and the parsonage exemption in particular — are equivalent to direct government spending. The tax brief points out that ministers with higher incomes receive a greater tax subsidy than lower-income ministers. The housing allowance statute results in substantial entanglement between the government and churches, such as requiring the IRS and courts to determine which beliefs or purported beliefs should count as a religion for tax purposes, what constitutes a church or a minister, and ministerial functions, whether an ordained minister working for a secular nonprofit counts as a minister if she gives one sermon a year, and similar quandaries. The tax professors point out that ministers working not in churches but as teachers, counselors, directors of business services, alumni relations, and even as basketball coaches, now qualify for the exemption. “In sum, Section 107 requires the government to investigate and oversee both churches and ministers, delving into both doctrine and practice,” the brief states. The tax brief, written by Adam Chodorow, a research scholar and associate dean of academic affairs at Sandra Day O’Connor College of Law, Arizona State University, is joined by tax experts from a variety of public law schools and even religious schools of law, such as Saint Mary’s College of Law and Loyola University of Chicago School of Law. “We greatly appreciate their setting the record straight with such clarity, so that reason will prevail in this case, along with the Constitution,” says Gaylor. Gaylor v. Lew has appellate case numbers 18-1277 and 18-1280. FFRF is represented by outside counsel Richard L. Bolton. Chodorow has requested time to present at the oral argument, which has not yet been scheduled. The inaptly named Evangelical Council for Financial Accountability, Union of Orthodox Jewish Congregations of America, National Association of Evangelicals, Lutheran Church-Missouri Synod, Christian Legal Society, National Jewish Commission on Law and Public Affairs, National Rabbinical Council of America. The Church Alliance’s brief was joined by the American Baptist Churches in the U.S.A., the American Conference of Cantors, The Church of Jesus Christ of Latter-day Saints, Church of the Brethren, Church of the Nazarene, Churches of God, Evangelical Covenant Church, Evangelical Lutheran Church in America, Moravian Church in America, Salvation Army, Union for Reform Judaism, Unitarian Universalist Association and UU Ministers Association, United Church of Christ, U.S. Conference of Catholic Bishops, the Wesleyan Church, Hebrew Union College, among others. Other briefs were submitted by the misleadingly named Alliance Defending Freedom, supposedly representing 8,899 churches. Other Religious Right legal groups include Pacific Justice Institute, Congressional Prayer Caucus Foundation, National Legal Foundation, and even Roy Moore’s Foundation for Moral Law. Seventeen state attorneys general also wrote a brief opposing FFRF’s lawsuit.